Kathryn was so very excited! She had just finished speaking with a reporter for a local arts magazine. He wanted to do a story about her as a jewelry artist. The magazine was 4-color, very substantial and distributed widely in her hometown area. Moreover, the reporter promised he’d include 5 pictures in the article. They made an appointment to meet in the middle of next week. And Kathryn was thrilled! The reporter met her at her home. She greeted him, somewhat giddy, not sure what to say, or say next. She thought she would let him lead the conversation and interview. She gave him a short tour of her house – her beading room, her den, her living room. The reporter marveled at her collection of Pez dispensers and puppets. A short time later, a photographer joined them. After 2 hours, the reporter and photographer had left. Kathryn was satisfied that they had seen several of her bead-woven jewelry pieces. She felt that she had given them a good history of how she got into jewelry making. The photographer had taken at least 20 shots of her around the house. The article was to come out in 3 weeks. Three weeks later, and there it was. A 4-color article. In a prominent local art magazine. About her wonderful Pez collection. And the long staircase from the street level to the living level in her house. And all her puppets. And information about her moving from Connecticut to Tennessee and having lived in Georgia. And she had three children. And no pictures of her jewelry. Or her bead room. Or her making jewelry. And no pictures, surprisingly, of her Pez collection or her puppets, given how prominently these were featured in the article. There was a picture of her staircase. Three pictures of her sitting on a couch or chair. And a picture of a treasured vase, and quite beautiful. Kathryn had thought – Now Nashville will know about my jewelry making and design prowess. Until she saw the article. And knew now she’d be known for Pez dispensers. The opportunity to get featured in a newscast or newspaper or magazine doesn’t come around often. However, when the opportunity does knock, this can have a big and positive impact on your jewelry making business. But you have to be prepared. You have to remain in control – even if this leads to a little tension between you and the reporter. Determine the 4 or 5 or so major points you want to make about yourself as a designer and about your jewelry. No matter what questions the reporter asks, turn the conversation back to your major points. During the interview, keep making the major points. When the reporter returns to his notes to quote you, this will be all the material he has to draw from. If you give a reporter a tour of your home, only take him to the jewelry-relevant points of interest. Where you make the jewelry. Where you display your jewelry. Where you have people try on your jewelry. Where you get inspiration for your jewelry. And if there’s a photographer or cameraman there, direct and narrow their attention and focus as well. Pre-think what will be the 5 or so most strategic pictures that should be taken. Definitely have an “action” shot that shows you making jewelry. Perhaps another “action” shot that shows you fitting someone with your jewelry, or them trying on your jewelry. 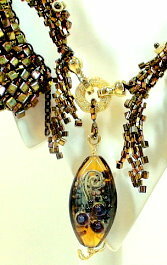 Have some pieces of your jewelry “staged” so that they are photo-ready, with great background, foreground and pedestal. Don’t wait to take your jewelry out of a box to show them. Because jewelry is made up of very small pieces, it might not photograph well. Show the photographer the parts of your jewelry that lend themselves to detailed close-ups. Make your points. Get your images. When the reporter (and photographer or cameraman) arrives, butter them up, and find out how deep and wide their knowledge is about jewelry. If they only have a shallow understanding, educate them. How do you find the parts? How do you determine how the pieces should be constructed? Do you use specialized tools? How does someone learn to do what you do? Also, ask them about the “audience.” What kinds of things do they think that their “audience” would most like to know about jewelry and jewelry design? Third, before they begin, ask for tips. If this is getting filmed, ask about how you should stand, (or sit), the direction you should look at, and any do’s and don’ts, as they see it. What kinds of things do they like to see/hear in an interview? Last, when you are done, ask to get a copy. Be sure you will be sent copies of the written articles, or DVD or video copies of any filming. Don’t assume they will automatically send you something. Don’t think all this will make you seem too pushy. Remember: Everyone will be happy if the story comes out great!